So it’s been two weeks since the last blog. I blame it on Averi. That kid keeps me busy! Cafeteria during the day, then tennis, girl scouts and Hebrew School in the afternoons. Plus homework! And 1st grade homework is so much more involved then kinder! Last year I was insulted by how basic her homework was. I would love to be insulted again! By the time it’s all done I’m too drained to cook and too tired to write. The other craziness that has been keeping me busy has been trying to plan her birthday party. In Tucson it was easy. Rent a jumping castle for a couple hundred dollars, hit Costco for food, and have people over to the house. We lived on four acres – there was plenty of space. Her last party there had over 100 people and it was a breeze. 100 people will not fit in our two bedroom condo with no outdoor space. Technically I could have it on our mezzanine level, which is a big open space with a little kitchen but 1) that’s the area all residents go through to get mail and go outside and 2) that would require way too much managing of activities by me to keep 30 odd kids entertained. No thanks. Which means the only option is t have her party somewhere. But holy hell, people, I am Tucson Level! And apparently only kids of Miami Level can afford parties here if you want more than eight people there. I checked one of those painting places. $35 a kid, just for painting, food extra. So for the 30 kids we are expecting, $1050. Before food. I checked one of those color me mine pottery places. Little better in that its ONLY $30 a kid and that gets you food. But still, $900. Add in the extras that always come up, and bam, we are back at the $1000 mark. For a party for a seven year old. I tried the gymnastic places, and again, $1000. It’s like if the party would be less then $1000 then it isn’t worth doing. Speaking of parks. No love there either. I tried two that have ramadas, but they don’t have bathrooms. I tried one that had a bathroom, but no covered ramadas and my fear of rain is strong. Averi’s last party in Tucson had a massive rain storm and we ended up spending majority of party in our garage. Thankfully my cousin came through for me. There is a great ice skating rink at a community center in her neighborhood. And if you are a resident you can have the whole rink plus party space for unlimited people, for $267. $267!!! Like our town, this neighborhood has overpriced nice homes, so I’m guessing their property taxes are helping to underwrite the rink. And the bowling alley that is there. Thank you, rich homeowners! Now we just need to figure out bringing food for around 60 people. So stay tuned for that. In the meantime, enjoy the dish I made last night – Spicy Thai Noodles. I love this dish. You can use any combo of protein and veggies you have on hand, which makes it perfect for me. 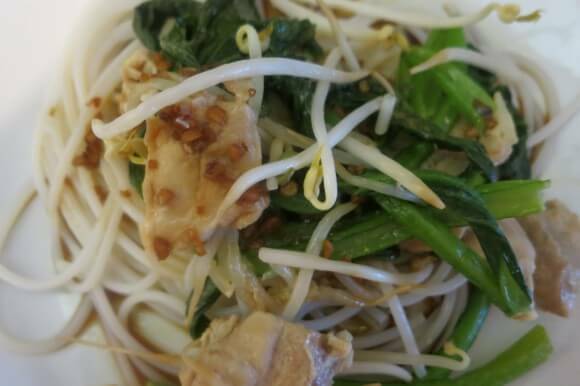 This time I used chicken, choy and added some bean sprouts for crunch. According to the recipe you are suppose to strain out the crushed red pepper in the sauce but I didn’t for two reasons – one, lazy. I hate extra steps and I really hate extra steps that require extra equipment that would then need to be washed. And two, crushed red pepper brings spice and the husband loves spice. You can make whichever way you prefer. Just enjoy! Prepare your noodles and protein. Saute your veggies. 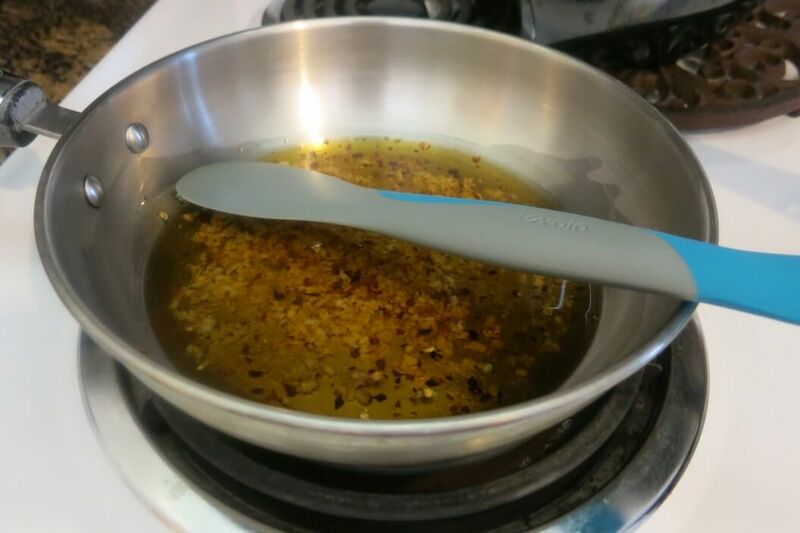 Combine red pepper, garlic and oil in pan. Cook for 2 minutes over medium heat. 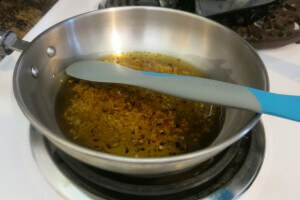 Add honey and soy sauce to oil, whisking together. Pour over noodles, mixing until combined. Add protein and all remaining ingredients. Enjoy!